The rapid growth and development of children require higher intakes of many vitamins, minerals, and other nutrients. Unfortunately, numerous scientific studies have shown that many children don’t get enough of the essential nutrients they need to thrive. Searching for the best multivitamin for kids? Total Balance Children’s is a complete nutrient system specifically designed to support the nutritional needs of children, adolescents and teenagers. It provides the vitamins and minerals many children are lacking – including B vitamins, vitamins A, C, E, D3, calcium, magnesium, zinc and selenium – along with many more. Only the best natural, bio-available ingredients are included, and special care is taken to ensure they are at the right levels for a growing child. Total Balance Children's goes much further than some children's multivitamin supplements, which are generally just a collection of (often synthetic) vitamins and minerals. We have synergistically blended 84 bio-actives ingredients, making this formula the best children’s health supplement money can buy. Not only does it provide nourishment to all of your child's organs, it also supports your child’s health, energy, immunity and endurance. Unlike the many common supplements found in your supermarket, we do not use synthetic or cheap vitamins and fillers. We choose instead to fill our products up with as many high-quality ingredients as possible to provide the most comprehensive all-round support for your child's growth and development. Total Balance Children's is also dairy and gluten-free and does not contain any artificial colorings or flavorings. The tablets are also specially coated to enable ease of swallowing and enhanced absorption. Other Ingredients: Microcrystalline Cellulose, Dextrose, Enteric Coating (Purified Water, Ethylcellulose, Ammonium Hydroxide, Medium Chain Triglycerides, Oleic Acid, Sodium Carboxymethyl Cellulose, Talc, Polydextrose), Maltodextrin, Silicon Dioxide, Sodium Carboxymethyl Cellulose, Tripotassium Citrate. Does not contain soy, dairy, peanut, gluten, crustacean. Daily Serving: Children (girls or boys age 5) - 2 tablets / (girls or boys age 6 to 12) - 3 tablets. For optimal results take first thing in the morning. Best combined with Omega 3 Children's for maximum support for learning, focus and mood. 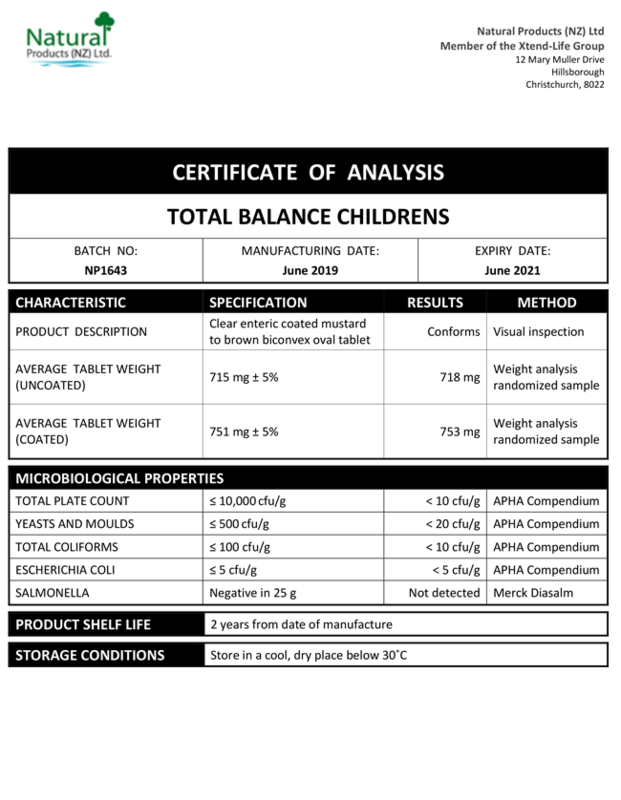 We have included below a copy of a typical Certificate of Analysis (CoA) for our Total Balance Children's product. All of the Xtend-Life Total Balance Children's products have the same formulation and standards. Please note that we produce all of our products regularly throughout the year. You can be assured that every bottle, from every batch will meet these exceptional standards, and it will be from a current, recently produced batch. If you would like any more information about our commitment to providing you with the best quality nutritional supplements, please contact us. Boost your digestive health with the power of 100% pure New Zealand kiwifruit. One of the freshest fish oils available, containing 350mg of DHA per serve to support optimal overall health and vitality in a half sized soft gel. What is the recommended dosage for Total Balance Children's? Daily Serving: Children (girls or boys age 4 to 5) - 2 tablets / (girls or boys age 6 to 12) - 3 tablets. Combines well with our Omega 3 Fish Oil products and Kiwi-Klenz for optimum daily health. What is the size of a Total Balance Children's tablet? The Total Balance Children's tablets are like a slightly 'flattish' oval shape, 1.5cm long, 0.5cm deep and 0.5cm wide. They actually slide down very easily because of the enteric coating, so older children shouldn't have a problem. What are the benefits that my child may receive from Total Balance Children's? Total Balance Children's has a wide range of benefits and helps to provide nourishment to all the body organs, including delivering valuable support for brain development. Various nutrients, such as Zinc and Dimethylglycine (DMG), are known to support brain function and may help to foster a stable mood and attention span. It may also help support the digestion system by optimising the absorption of nutrients, plus encourage a strong and resilient immune system. This product can start offering benefits immediately by replenishing nutrients that it may be difficult for some children to obtain through the diet alone. Results may not necessarily be noticeable, but rest assured the product is doing its job unseen on the inside. The benefits may only be realised if the supplement was to be stopped. A key feature of Total Balance Children's, as with all Xtend-Life products, is that we use only the highest quality ingredients to support the most effective absorption. How does Total Balance Children's compare with other children's vitamin products on the market? Most children's vitamin supplements are basically simple vitamin / mineral formulations, often using poorly absorbed, synthetic ingredients. Other essential nutrients that may be missing from children's diets are not included, usually because of cost. Total Balance Children's is different because it provides an exceptionally wide range of vitamins and minerals, as well as many other valuable nutrients which are not obtained in a typical childhood diet. For example, we have included Olive Leaf Extract to support the immunity, Aloe Vera to aid digestion and Dimethylglycine (DMG) to support healthy behaviour patterns and concentration levels. It is important to note that we utilise only the most natural and bio available forms of vitamins possible in our products, we do not cut any corners in regards to price. Is Total Balance Children's likely to give my child too much energy and stop them from sleeping? Your child could well have more energy as a result of taking Total Balance, but this should not affect their ability to sleep soundly. As some of the ingredients may have a mildly stimulating effect in some people we advise ensuring the tablets are taken before dinner to ensure the sleep is not interrupted. Will Total Balance Children's help my child to concentrate better at school? Total Balance Children's is valuable to support your child's overall health and has various ingredients that may help support their brain function by aiding concentration and supporting a balanced mood. However, to offer the optimal support for we would advise adding our Omega 3/DHA Children's, as a complementary product. Is it possible that my child could feel any negative effects after starting to take Total Balance Children's? It is not likely, but it is possible that your child may experience minor symptoms over the first few days. This can occur as Total Balance helps to activate their system to process any toxins, sometimes resulting in mild and temporary side effects. These may include a change in digestion, minor headache or a change in mood. If these are experienced we recommend reducing the dose by half until they pass. Also make sure that your child drinks plenty of pure water to help flush their system. Any effects should be mild and relieved within a week or so; if they are not we suggest stopping the product and contacting us for further advice. This is not a comment we hear often as the majority of children have not had sufficient time to build up a notable amount of toxins, in comparison to an adult. Will Total Balance Children's help with allergies such as hay fever or pollen? Many allergies are thought to be brought on by several factors, one of which may include particular nutrient deficiencies. Allergic symptoms, such as those experienced with hay fever are an immune response mechanism as the body tries to manage a specific allergy. Total Balance Children's helps support the optimal function of the immune system, which may help the body to manage various immune responses and thereby possibly limit hay fever symptoms. As with any natural supplement, the results and time taken to see these will vary between individuals. What else can I do to enhance the benefits of taking Total Balance Children's? To enhance the benefits of Total Balance Children's we would advise adding 1 - 2 soft gels per day of our Omega 3/DHA fish oil to provide your child with the very best supplement foundation. This pure, potent and fresh blend of Hoki and Tuna oil is also available in a smaller soft gel size, that is easier to swallow and ideal for children; please see the Omega 3/DHA Children's for further information on this product. Fish is oil is valuable for developing children as it helps to support organ growth, brain development and the immune system and combines very well with Total Balance. The enteric coating on the Total Balance tablets protects some of the sensitive ingredients, such as SAMe, from being be destroyed by the stomach acid. The enteric coating ensures the tablets do not begin dissolving until they enter the small intestine, where the best possible absorption can occur.